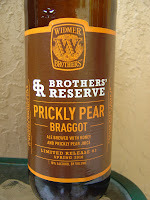 Today I'm drinking Brothers' Reserve Prickly Pear Braggot brewed by Widmer Brothers Brewing Company in Portland, Oregon. 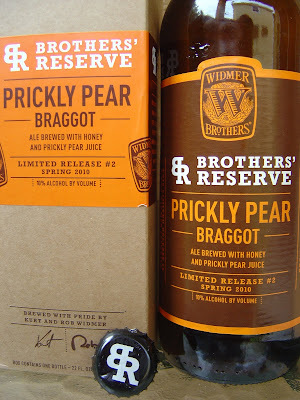 This 22 ounce bottle comes in a box, presumably because it is a one-of-a-kind Brothers' Reserve beer. This one happens to be Limited Release #2 corresponding to Spring 2010. The label says this is a Rob Widmer favorite and denotes that with an X in the box by Rob's name. Kurt's name is there too but no X. Not sure if both are allowed to have checks, but Kurt didn't X his Box if it was allowed. Probably when it's your brewery, you can make whatever rules you want. 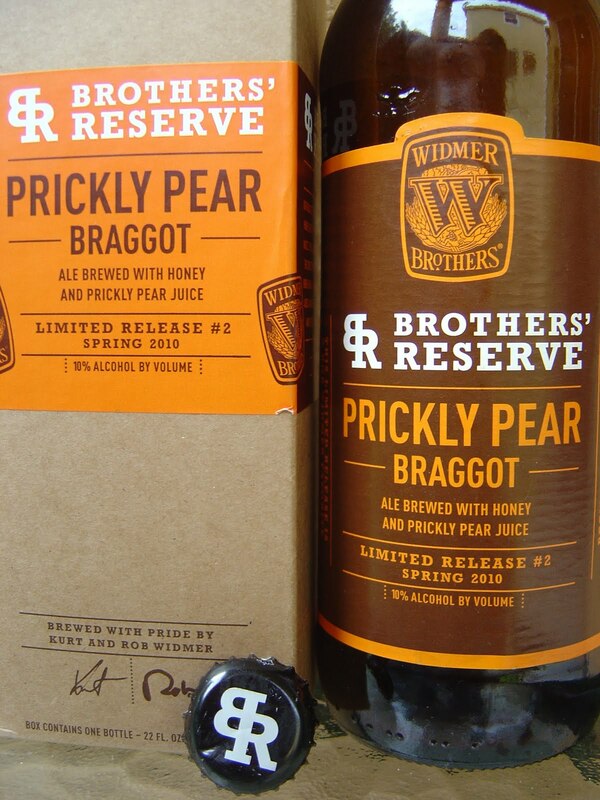 Nice fruity pear, sweet syrup and alcoholic booze aroma. It works! There is a thick and syrupy start, plenty sweet with quite a bit of honey and (mostly overly) overripe pears. The 10% alcohol is noticeable, providing a sweet wine type component to the profile. And while surely there, the alcohol is mostly tame (and I was very worried that was not going to be the case). Lightly spicy, cider-ish. Pretty flat, yet very smooth. Medium body, yet very simple. Honestly, this doesn't really taste like a beer at all and is a little weird. 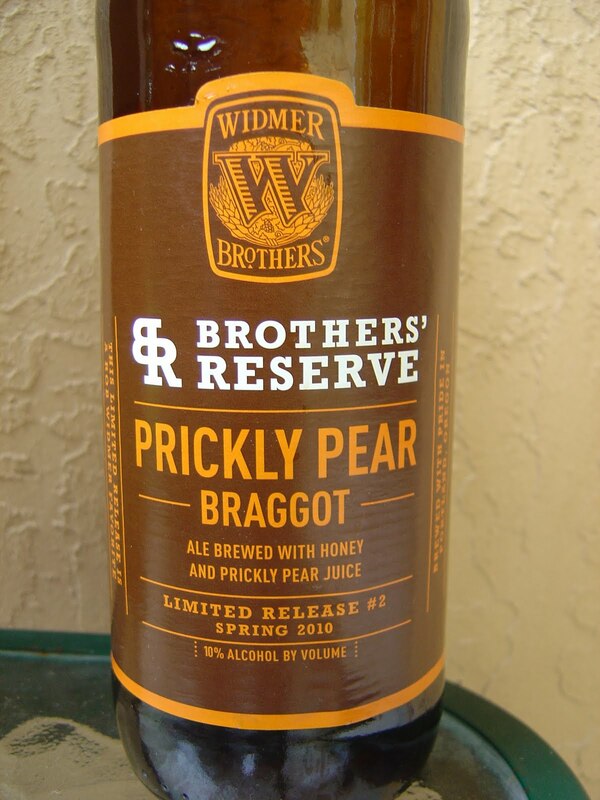 In a nutshell, too sweet, and that sweetness is linked to the overly ripe pears mentioned above--they are borderline. Interesting, yet not for me. I'm still drinking it, too. Getting harder! No pictures tonight, Holmes. I can't find the camera. I am pretty sure the wife or mi suegra took it somewhere today after using it last night, showing off some photos from the shoot. When I find it, I'll try to remember to photograph the bottle and box for you! Update 7/24/2010: Here are your pictures! Hey Joel. I'll be waiting to here what you think of it! I think this was probably the first braggot I have ever tried, so I wasn't really sure what to expect - but I think I should've saved it for a night that wasn't so hot. Wait what's a braggot? Is that a beer style? Also have you had, like, an actual prickly pear before? I don't know if I have ever tasted one. Or are you just referring to the taste of a generic pear in your review? Anyway this one sounds interesting if maybe weird. Cool review, thanks. Yeah. Braggot is some kind of style. Like high heels I guess. Except this style is some blend of beer with something, maybe booze, I think, and the drunk writers from the 1300's were writing about it. So it's that old, and I don't think too common. As far as Prickly Pear, yeah, I have no idea what the hell that tastes like. I'm pretty sure my review just says overripe (and that over can be tripled) pears, like Bosc or some crap like that. A braggot is mead (honey wine) blended with beer. Thanks for clearing that up. It tasted exactly like that--honey and wine and beer. A little too sweet and flat for me, but not bad.